She outlined her policy pledges, including constructing student housing, increasing housing benefits for under-27s, and introducing a short-term tax-exemption scheme for businesses that hire under-21s. Nearly a quarter of young voters support Le Pen (24 per cent) matching support for her main rival, former Socialist party member and former investment banker Emmanuel Macron. Another 19 per cent of 18-24-year-olds want the far-left candidate Jean-Luc Mélenchon to win, and 14 per cent said they would vote for hard-leftist Benoît Hamon of the Socialist party. Only 10 per cent said they would back the centre-right Republican Party candidate François Fillon. She also attacked “savage globalisation”, which she blamed for ruining French industry and creating mass unemployment, adding that France is “without control, without protection, without frontiers”. 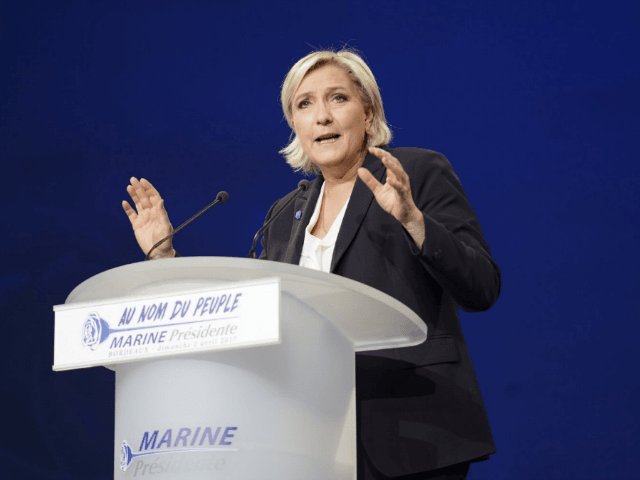 Defending “grassroots democracy” and positing herself as the “real alternative”, Le Pen denounced what she called the “coalition” of opposition including Macron, who is running under the political movement En Marche! (Forward! ), and Fillon. “Macron’s positive discrimination means negative discrimination for others in their own country!” she warned. Pro-mass migration, globalist, and cultural leftist Macron, who has called for positive discrimination in employment, is attempting to court migrant communities – but in the process may struggle to convince France’s native working class. Le Pen also singled out the mainstream media, which she accused of colluding with the establishment candidates. “The media are raging against us with their venomous arrows,” she said. “It is not a question of commenting [because they are bound by journalistic ethics to do so], but of denigrating, of caricature, because they know how to do only that,” she affirmed. The next televised debate of all candidates will be broadcast on 4 April on BFMTV. Current polls suggest Macron is just ahead of Le Pen (25 per cent to 24 per cent) ahead of the first round of voting due to take place on 23 April. This entry was posted on lundi 3 avril 2017 at 18 h 17 and is filed under France. You can follow any responses to this entry through the RSS 2.0. You can leave a response.